If you have received a moving violation on Long Island, an experienced attorney can assist you. With over 20 years of experience serving local Clients, we can help fight your moving violations ticket and procure a positive outcome. Contact us today for a FREE consultation. Call (516) 280-7288. What Is Considered A Moving Violation On Long Island? You’ll be charged with a moving violation if you violated a traffic law while your vehicle is in motion. A few common examples of moving violations are speeding, failing to yield, running a stop sign or failing to stop for a school bus, illegal turns, tailgating, driving a car that is not registered, driving a car without insurance, using a cell phone while driving and driving under the influence of drugs or alcohol. Committing these violations and failing to respond may be punishable by the Department of Motor Vehicles (DMV). It can carry points to your driving record and generally could affect your driver’s license and insurance rates. Additionally, the DMV may suspend your car’s registration or driver’s license. If you recently received a moving violations ticket, it is important that you contact an experienced traffic ticket lawyer. Contact the Law Offices of Michael W. Alpert today. Call (516) 280-7288 call for a free consultation. We will assess your case and assist you in forming the optimal plan to handle your case. NOTE: 11 points in an 18 month period will result in a suspension of driving privileges. NOTE: Three (3) speeding convictions in an 18 month period can result in license revocation for a period of six (6) months. 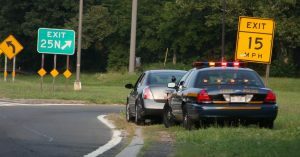 What To Do If You Are Pulled Over For A Moving Violation In The State Of New York? Michael W. Alpert is a highly reviewed traffic attorney who can help you understand how serious your moving violation is (whether it is minor or major) as well as your best course of action to either fight it or get it dismissed. For more information or to get in touch with our moving violations lawyer, please call (516) 280-7288 or fill out our CONTACT FORM here.